Email moonwateraussies1@gmail.com for more information! Are your animal-loving kids looking for something to do during school breaks? Week-long dog day camps are designed for kids in kindergarten through middle school and are offered during most of the Encinitas school district breaks; two-week October break, winter break with modified schedule due to holidays, spring break and almost every week during the summer. All ages of school children are welcome. Enrollment is limited due to the fact that only Moonwater Aussie dogs are used and we want to ensure that all children get plenty of hands-on learning. make skill-learning fun, including games like red-light-green-light and follow the leader. Dog care, including grooming, is covered in-depth and children have plenty of opportunity to practice these skills. Dog-related crafts and activities supplement the daily camp learning and give the dogs and students a chance to relax and rejuvenate. Craft/activities include things like making chew toys and baking dog treats. Children will also develop a dog care record book to hold all the informational sheets covered in the camp; from training instructions to treat recipes. Field trips may take place depending on camp schedule, the local show schedule, and available parent drivers. We sometimes have special events scheduled during camp hours. This can include anything from pet therapy sessions to guests coming to teach dog tricks. Often, especially during summer, the dog camps are centered around a theme and may include a mini-show for the kids and their parents to enjoy. Instruction is led by Judy Pedery-Edwards, owner of Moonwater Aussies. Judy has over fifteen years experience with the Olivenhain Valley 4-H Club as the Dog Project Leader and as a past Club Community Leader. She has been teaching kids, primary through college-level, for over thirty-five years. 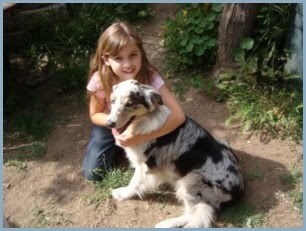 Judy has been raising, training, breeding and showing Australian Shepherds for over 40 years. Her award-winning stock, which has been her life force, provides for a "fun while learning" approach - the same hands-on approach that made her very successful during her teaching career. Putting this approach together with her professionally trained dogs makes for a great camp full of diverse activities and experiences. Camp is located in Arrowbear, California or Encinitas, CA. Camp fees include animals and supplies and are $275 per week; holiday camps are pro-rated. A $75 deposit will reserve your space. $200 balance due the first day of camp. Camp hours are 9:30 am to 2:30 pm, Monday through Friday unless otherwise noted. Campers should bring a packed lunch and dress in "camp clothes" and running shoes. *Enrolled camp participants should fill out the Dog Camp Release and Dog Camp Registration, and bring them to the first day of camp. * If those links do not work, copies of the form can be found at the bottom of this page under Attachments.